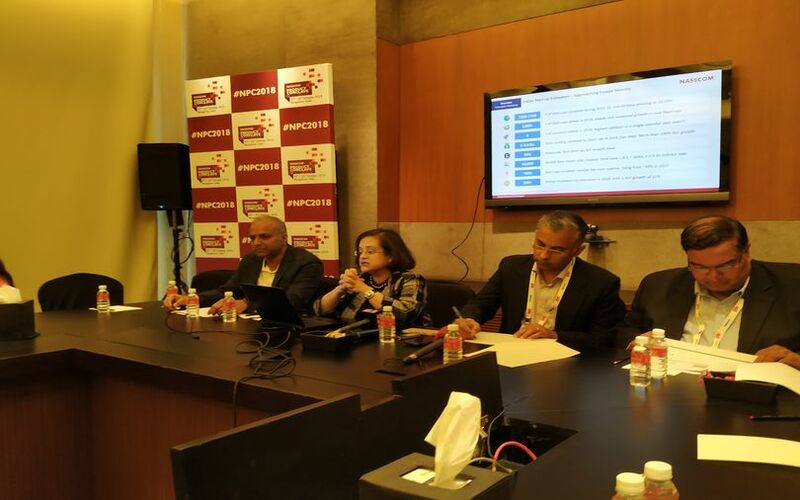 NASSCOM president Debjani Ghosh (second from left) and other representatives of the industry body at NASSCOM Product Conclave in Bengaluru on Thursday. Seed funding in the Indian startup ecosystem has declined by 21% in 2018, Debjani Ghosh, president of the National Association of Software and Services Companies (NASSCOM), said at the NASSCOM Product Conclave in Bengaluru. The total amount of seed funding came down to $151 million this year (till September) from $191 million in 2017 (till September), says a report on the Indian startup ecosystem by NASSCOM-Zinnov. To address the decline, Ghosh said that the government can come out in support of early-stage startups in the country. “This is where risk-taking happens. If you shut the tap, innovation will be killed,” she said, adding that India needs a structural approach towards early-stage startups. She further said that though seed funding has come down, the overall capital flowing into startups has risen this year. Also, the time taken for Indian startups to become unicorns (companies valued at more than $1 billion) has come down drastically. According to the NASSCOM-Zinnov report, titled The Indian Startup Ecosystem 2018, this year saw eight unicorns, the highest ever, being created. The report also said that India added 1,200 startups in 2018 and the country continues to be the third largest startup ecosystem in the world, taking the total number of tech startups to 7,200-7,700. Startups are also responsible for creating 40,000 new direct jobs. Investors pumped in a total of $4.2 billion this year (till September) versus $2 billion in the same period last year, the report stated. Early-stage (Series A and B) funding saw a slight increase of 4% to $1 billion from $993 million last year. Meanwhile, late-stage funding (Series C and beyond) more than tripled from $847 million last year to $3 billion this year. Last month, NASSCOM had announced its Accelerate 10X programme, which is a part of the NASSCOM 10,000 Startups initiative, to mentor 100 ‘mature-stage’ startups every year in the deep-tech domain. The number of deep-technology startups are growing at 50% every year even as the overall startup ecosystem grows at 12% annually, according to NASSCOM’s report. Deep-technology refers to startups working in technology domains like artificial intelligence, analytics, augmented reality/virtual reality, internet of things (IoT) and blockchain, according to NASSCOM. Most of these startups were in the business-to-business (B2B) segment, which contributed to 43% of the total startups founded in 2018, the report said. Around 15-17% of the total startups founded were in the enterprise software segment, ahead of other popular industry verticals like fintech (13-15%), e-commerce marketplaces (11-13%) and health-tech (7-9%). The number of AI startups have grown at a compounded annual rate of 54-58%, securing 120% growth in funding with over $150 million being invested in these companies in 2018, the report added. Blockchain startups have seen a 500% growth in funding, albeit from a lower base. NASSCOM said that there were a total of 1,200 startups founded in deep-tech in the last five years. IoT, data analytics and AI contributed one-fourth each of the total startups founded.